Thank you to the lovely team of membership greeters for Monday’s program. Your welcoming presence and the gift of your time are deeply appreciated: Jan Agner, Celeste Eastman, Barb Hunsinger, Deb Speer, Bonnie Vanni, Diane Waldapfel, and Joyce Walton. Click this image to view the fashion show program & see what begins at 10am! All 300 seats have been sold! The models have chosen their outfits and the raffle baskets have been put together. Our 50/50 raffle is now at $2,500 and climbing! If you have a luncheon ticket, please join us starting at 10:00 a.m. for check-in and shopping. Our January program was very well attended. We learned about the Tumacacori Mission and on February 26th we will learn about the Tubac Presidio. This will complete our preview of the things to come on our field trip in March. Reserve Your Seat for the Field Trip NOW! Our March 26 field trip to Tumacácori National Historic Park and Tubac Presidio promises to be great fun and very informative. Seats on the bus are being sold now. (Over 50 seats out of 108 were sold at the program last Monday!) Reserve your space by contacting Janice Messer (events@womenqc.com) or Peggy McGee (pjmcgee@cox.net). Reservations are $40 per person and include bus fare, gratuity, guided tours at each site, and lunch at The Italian Peasant in Tubac. Don’t miss this fun time. Buses begin loading at 9:00 a.m. When making your reservation, let Janice or Peggy know if you have a National Parks Pass in your own name (sorry, spouse’s pass won’t work). Plan on bringing your pass on the day of the event. This will allow the Park Service to charge less to TWOQC. While you will not personally receive a discount, TWOQC future programs will benefit from the overall savings. The Baby Bottles make their 1st public appearance tonight at 4:30 p.m. at the Madera Clubhouse lobby just prior to the concert. Please consider this… if you are attending the concert or just having dinner, please stop by with any loose change or extra dollars you may have to “Help Us Fill the Baby Bottles”! Our donation box in the lobby has been very busy being filled with diapers, outfits, onesies, etc. Thank you to all who have already stopped by. The next committee planning meeting will be Wed Feb 14th at 10:00 a.m. at the Kino Conference Room. Contact Kathi Krieg at (520) 625-5419 for more information. Programs: Would you like to help out? Do you have an idea for a program you would like to attend at TWOQC? Do you have a suggestion for a new or different activity you would like TWOQC to consider? The Programs Committee wants your ideas! Please send them to the committee by contacting Diane Quinn at programs@womenqc.com. The Programs Committee is looking to expand and would welcome a few new members. This committee researches programs and entertainment options on behalf of TWOQC. 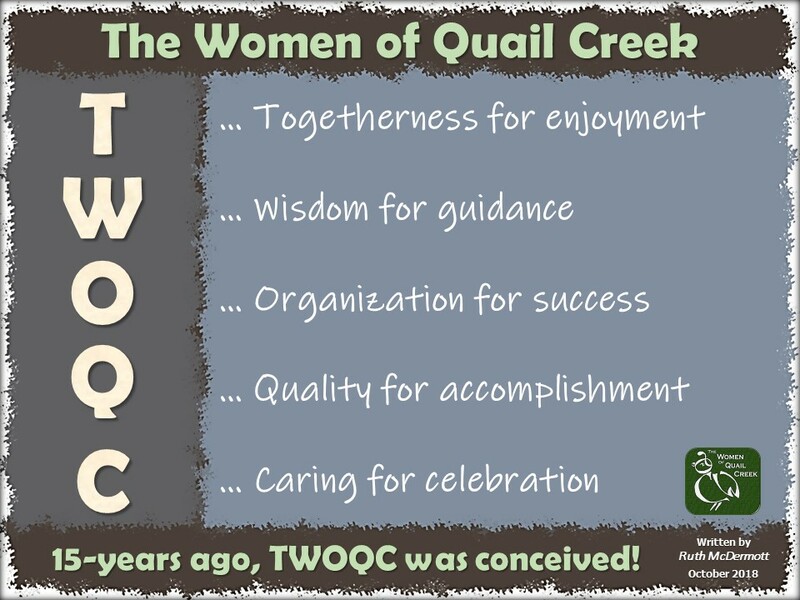 Members then contact prospective presenters and work with other members of TWOQC to make the program happen. Here is your chance to get involved with another fun side of our group. Interested? Contact Diane Quinn, programs@womenqc.com. Our Member Spotlight Committee will be randomly reaching out this year to “spotlight our members”, a way to get to know each of you. This is not obligatory and if you wish to participate (which we hope you will) please share what YOU want us to know about you. And, wouldn’t you know – they selected me as “numero uno” for 2018. Pamela Rodgers is the new President of TWOQC organization, now a member for over five years. Pam was born and raised in the San Francisco Bay Area where she met and married her husband, Mark (the love of her life for over 43 years). Their son is a professional golfer, and Pam & Mark enjoy time with their two grandsons. At 18, Pam worked at the Bank of America in data entry, and she coached a high school’s women water polo team for five years. After studying computers and IT, Pam was employed in the newspaper industry as a compositor working 14 years for local papers. With an administrator’s background, she worked for a lumber company and a commercial company specializing in Trader Joe’s stores. Pam retired to Quail Creek at age 53. She enjoys playing golf, reading, quilting and volunteering with TWOQC. She was the Chair of TWOQC Baby Shower for Military Families for three years, saying each year she gets her ‘baby fix’. Pam currently works at the Madera Clubhouse Concierge Desk where she loves the personal contact with everyone. “Thank you” to this week’s FMM contributors: Yasmin John-Thorpe, Kathi Krieg, Diane Quinn, Carol Shelton, and Angie Werner.